Some mornings I find myself craving something a little different than plain old pancakes. 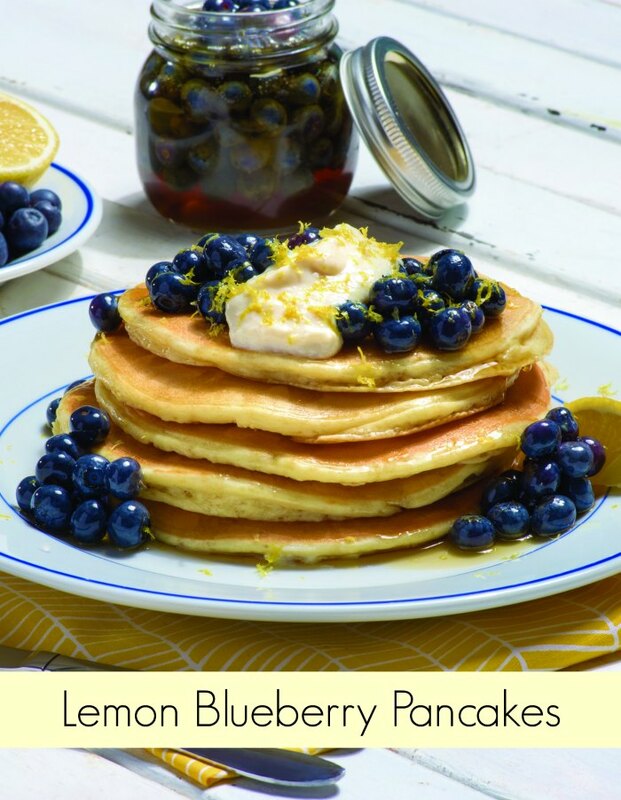 This Lemon Blueberry Pancakes Recipe is sure to wake up your taste buds and get your senses going. A special thanks to Silk for providing this recipe, which makes 6 servings. Step 1: Whisk together flour, baking powder, egg replacer, salt and nutmeg; set aside. Step 2: In separate bowl, whisk together yogurt alternative, 2 tablespoons oil, sugar, lemon juice, lemon zest and vanilla; stir into flour mixture until just combined (batter will be lumpy). Let stand for 15 minutes. Step 3: Heat large, non-stick skillet over medium heat; brush with remaining oil. Pour 1/4 cup batter per pancake into skillet, leaving space between each pancake. Add 1 tablespoon blueberries to each pancake. Step 4: Cook in batches for about 2 minutes, or until bubbles form on the surface; flip and cook for 1-2 minutes, or until golden brown and set in the center. Wipe skillet between batches. Store prepared pancakes in warm oven until ready to serve. Step 5: Serve pancakes with remaining blueberries and maple syrup. 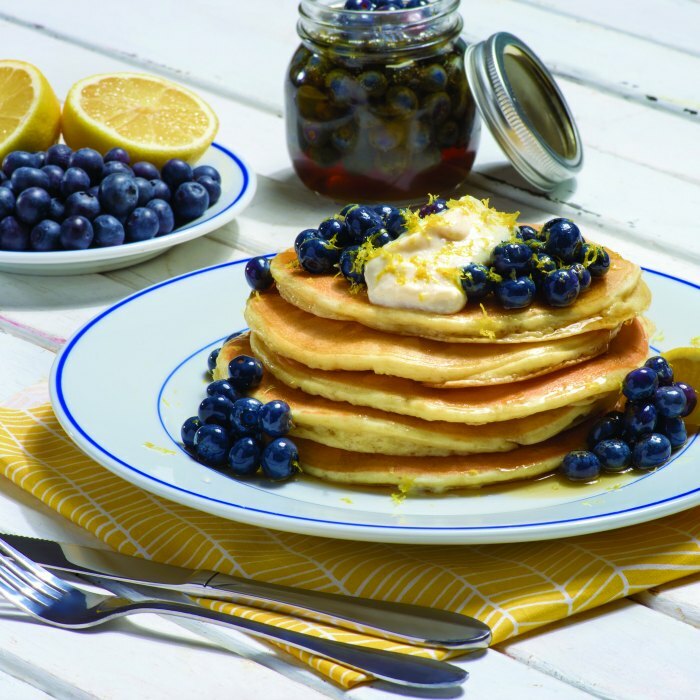 This Lemon Blueberry Pancakes Recipe is sure to wake up your taste buds and get your senses going. Whisk together flour, baking powder, egg replacer, salt and nutmeg; set aside. In separate bowl, whisk together yogurt alternative, 2 tablespoons oil, sugar, lemon juice, lemon zest and vanilla; stir into flour mixture until just combined (batter will be lumpy). Let stand for 15 minutes. Heat large, non-stick skillet over medium heat; brush with remaining oil. Pour ¼ cup batter per pancake into skillet, leaving space between each pancake. Add 1 tablespoon blueberries to each pancake. Cook in batches for about 2 minutes, or until bubbles form on the surface; flip and cook for 1-2 minutes, or until golden brown and set in the center. Wipe skillet between batches. Store prepared pancakes in warm oven until ready to serve. Serve pancakes with remaining blueberries and maple syrup. Holy goodness yes please! Those blueberries look fantastic. Lemon Blueberry is one of my favorite flavor combinations. It’s almost fresh blueberry season here. Thanks for sharing on Creative K Kids Tasty Tuesdays. Now these are some special pancakes! Saving and pinning and Looks delish and thanks for sharing on Throwback Thursday!